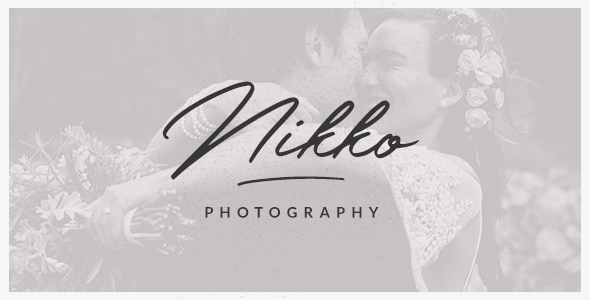 No matter if youâ€™re a fine-art photographer, shooting weddings, people, fashion, or if youâ€™re an artist or a designer â€“ Nikko Portfolio Pro will wrap your content into a beautiful presentation. Nikko is responsive, simple to setup and use, well documented and supported. It comes with 1-click demo import and a powerful and intuitive page builder. By following the information that comes with this theme, you will be able to create a portfolio website worthy of your work. Nikko Portfolio Pro takes the classic WordPress gallery and converts to beautiful, complex layouts. Stack multiple galleries with different numbers of columns on top of each other and create unique gallery layouts right inside your posts and pages. List all your upcoming events on your Events page and create contact forms that suit your business needs. Easily add custom fields, like â€œLocationâ€, â€œDateâ€ and more. Create extra page layouts for your website with Elementor Page Builder that is included in the theme. Make use of the default Elementor elements and custom Nikko elements â€“ such as the triple slider demonstrated on the homepage. Nikko Photography Pro will adapt to any screen size, letting your site visitors view your content from both small and large devices. All graphics and images will look sharp, clean and beautiful. Nikko Portfolio Pro for photographers is well documented in our online documentation. It contains step-by-step instructions on how to set up and manage your new WordPress theme. If you need help, we have a support forum as well where we can guide you through any issues that might arise. Click here and experience Nikko theme for yourself!